For our wedding anniversary Rich and I escaped to the beach for a turtle walk. :) Regular readers of my blog will know that Rich is a turtle freak, and I’m obligated to bring home as many photos of turtles as I can possibly fit on a memory card. 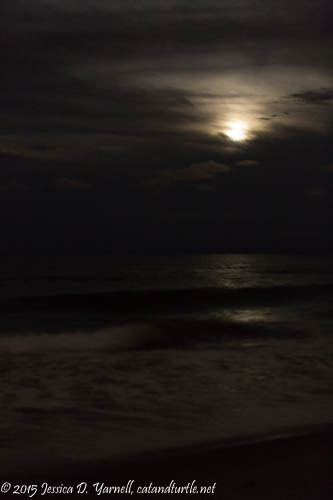 So Rich was in seventh heaven when we saw a Loggerhead Sea Turtle laying eggs. We joined the Sea Turtle Preservation Society for the walk. 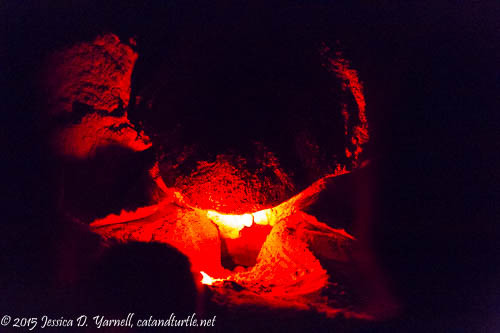 They have a permit that allows them to take groups onto the beach, find a Loggerhead turtle, illuminate it with a red light (the turtle isn’t bothered by it), and dig away the back of the nesting cavity to allow people to watch the turtle laying eggs. It was pretty cool. A picture is worth a thousand words, so a video must be worth at least a thousand pictures, right? I held my intermediate telephoto as still as I could for the short time that I could see the turtle through the crowd. The walk was pretty crowded. I think I counted about 30 participants and at least 15 volunteers who were helping to lead the walk. All 50 or so people stood behind the poor turtle as she laid her eggs. The scientists say that the turtle doesn’t mind the crowd as long as the people stay behind her. Still, all around us turtles were turning around and returning to the water without laying eggs. I felt badly for disturbing them. Our last turtle walk was better. We stayed at a small motel right on the beach, which was virtually private and right on the edge of the Archie Carr National Wildlife Preserve. 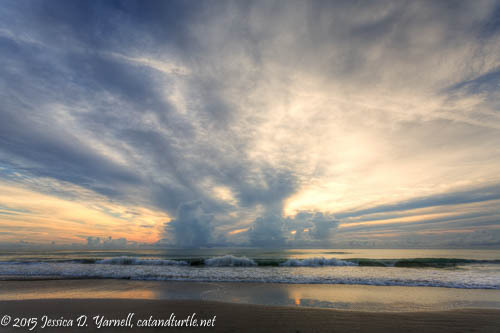 I got up early the next morning to see if I could find some turtle tracks to incorporate into a sunrise photo. 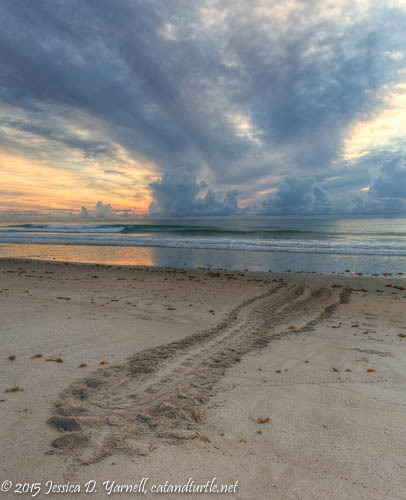 On the sand you can see the path that the turtle traverses as she comes on the beach, lays her eggs, and then circles back around to the ocean. I lucked out and found such a track right in front of the motel. It’s fun to realize that her eggs are nestled there under the sand, and in about 60 days, tiny baby turtles will emerge and make a run for the ocean. We might try to go back and see if we can find some hatchlings!